Carpet Bombing Culture, 9780955912191, 144pp. The world would be a better place if everyone continued to draw past their teens. But we're told from an early age that art, especially drawing, won't pay bills. You need to do something with your life, become a doctor, or a mechanic, or a...Teacher? If you really want to draw for a living, that's called illustration. And you'll need to go to college, and uni, start from the bottom and work your way up...Drawing if for kids Quoteskine is drawing for grown ups. Call it anti-illustration if you want. It celebrates the love of drawing and the subject matter that inspires each image. Taking in references from movies, books, music, famous figures and even including some self penned quotes. 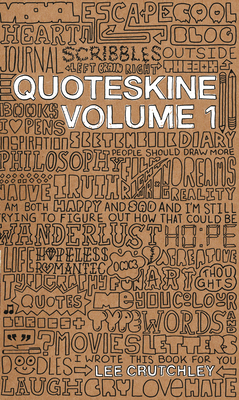 Quoteskine hopes to reconnect that childhood love of drawing and creativity with the adult brain. Forget a minute about the work you have to do and the bills you have to pay. Get lost instead in the grown up kid's world that is Quoteskine. Then it's your turn.